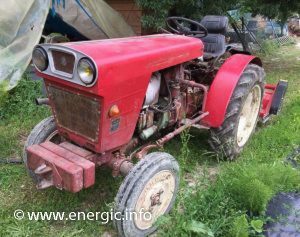 Energic Tracteur 535 (available in the late 1960’s early 70’s) . 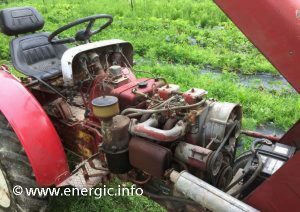 Energic 535 Tracteur – principally for orchard and vine work/farms. Engine.Two cylinder vertical in line, Slanzi DVA 1.500 (1447 cm3), 4 stroke, 2 cylinder, diesel, 35cv, Alésage x course : 96mm x 100mm, Injection direct, max., revs 2600rpm. 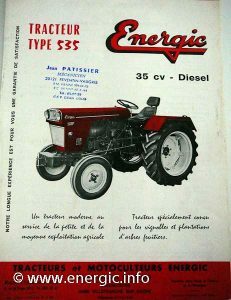 Energic vigneron 535 tractor moteur. 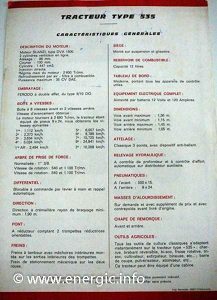 Energic tracteur 535 35cv diesel specification sheet. Starting. Electric starter, and full electric pack lights etc. Gears. 8 speed forward and 2 speed reverse. Differential blockable by lever(option automatic). 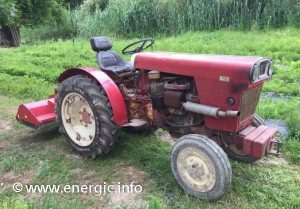 Energic vigneron 535 tractor with front and wheel weights! Speeds in gears. 1st = 10112km/h, 2nd = 2.373km/h, 3rd = 3.634km/h, 4th = 5.034km/h, 5th = 6.057km/h, 6th = 9.785km/h, 7th = 15.725km/h, 8th= 24.941km/h, Reverse 1st = 2.494km/h, 2nd = 10.268km/h. Reverse. 2 speeds are available in reverse. Clutch. 2 clutch plates dry, Ferodo double effect type 0/10 DO. PTO. 540/1100 independent and proportional. Normal 1 3/8 inch spline. 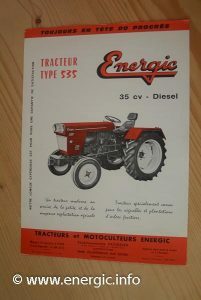 Energic tracteur 535 35cv diesel. Exhaust/Silencer. Fitted in a frontal right position, away from the driver. Seat with suspension. Wheels. 3 options; Pneumatic Tyre wheels front 500 x 15 and 9 x 24 Rear. Blockage independent for each wheel. Turning circle 1.9 m.
Hitch. 3 point hydraulic lift control automatic. universal hitch for towing implements. Energic vigneron 535 tractor with rotivator. Fuel consumption. 2 liters of fuel per hour dependent upon working conditions. the tank holds approx.12 liters. (Réservoir de carburant). Optional equipment/adaptions. Rotivator/fraise, high pressure reservoir for the the treatment of fruit trees/pulvérisateur (haute pression pour le traitement des arbes fruitiers). Trailer/remorquages. Wheel weights. Poulies diameter 180mm. Hoe/cultivateur special 10 dents, Plow; Brabant mono soc 1/4 turn versions cylindrical x 2 (25 and 30 cms), version 1/2 helicoidaux (20 cms).